I don't know why but I swear I get my BirchBox so much later then everyone else so its like I ruin the surprise because I tell myself I'm not going to look at anyone else's BirchBox post's or videos then a week goes by and I can't wait so I sneak a peak. 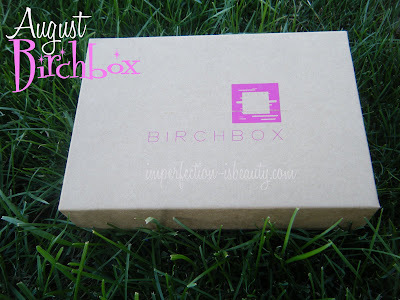 Anyway this is only my second BirchBox, I initially heard about birch box when I started watching beauty channels which hasn't been that long now. I immediately purchased my box because everyone's box was so fun and for $10 you couldn't beat it. I remember that some girls boxes had Nars products, and Laura Geller blushes. A Laura Geller blush runs about $32 therefore, that pays for 3 of your BirchBoxes. My first thought was I had to get it. Unfortunately, I have not received any makeup since I've gotten this box. For all means I'm not complaining at all, I just feel that this BirchBox was not well thought out and was thrown together. Before you sign up for your BirchBox they have a little questionnaire as any company would so that you know what products you can use depending on your skin type, style, etc. So that leads me to my box. First things first what I did not want, and thought was a little redic was a hair tie, really a hair tie? I'm not trying to be all negative Nancy here but a hair tie? The description of this "fabulous" hair band that they had to include in our BirchBox said: "This soft elastic gives your hair a sophisticated makeover- it looks as good on your wrist as it does in your hair" lol Firstly to be honest I really don't think hair bands look all that great on my wrist anyways. I do occasionally have one on my wrist but for the most part I carry one in my purse, and secondly I'm not going around searching for a hair tie that's going to flatter my wrist. My next product was Tocca Sunscreen Towelette SPF 30. Great I'm all about SPF in the summer no doubt and this isn't an all that bad product but in my opinion I don't need a $25 dollar sunscreen towelette when I'm perfectly happy spending my $7.49-$10 on Neturogena sunscreen. Don't get me wrong these are probably nicer then Neturogena, might be a little less messy, maybe even more convenient but I'd rather splurge on makeup rather then sunscreen towelettes I mean come on now that's just my opinion. Product Description: These oversized SPF toweletes are infused with Tocca's stella, a citrusy scent that channels the Italian Rivera. I also got a small sample of the Stila Sheer color tinted moisturizer. I do have this, it is a fabulous product. Goes on nicely, evens out your skin tone, and is even a pretty decent coverage. I do sometimes substitute my foundation with this moisturizer and set it with a powder. However I'm not sure people could really fall in love with this after one use. I mean some products I can use once and say that I like it but doesn't mean my skin is going to, so your really going to have to try it out for more then a day and who's going to spend the money on something that they think that they love using it a day? I just think they could have made this sample a little more reasonable so that people could actually try it. Last month's philosophy sample you could of probably got a week or twos use out of it so that you could actually "try it out" before you buy it. Product Description: Sheer color SPF 20 in medium, This longtime favorite is newly reformulated and better then ever: the oil free water resistant formula gives skin a luminous, fresh finish. I did get a hair masque by Number 4. I was pretty happy about this product. I understand these are suppose to be "samples" and not full size products I get that, but some samples you can't really "sample" if their so small you barely get enough to do what its purpose is. This sample I believe is a decent size, I do have a lot of hair so I just hope I have enough to use on my whole head. 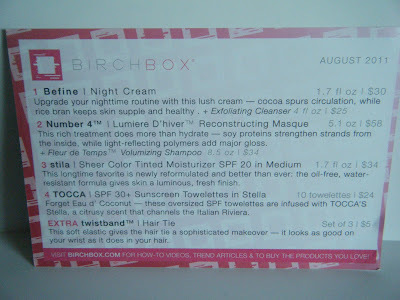 However, I was pleased with this product in my BirchBox. With this Came a sample packet of Fleur de Temps Volumizing shampoo. My hair is a different story then my face. I think I can use a product once on my hair and decide if I like it or not. So this I like as well. Befine Night Cream. Now this is a sample not a "one" try thing like the Stila moisturizer. (I still can't get over that) I will be able to get a week maybe two uses out of this so that I can see how my skin reacts to it, and really get the feel of it therefore, I was happy that this was included in my box this month especially because I was on a hunt for a night cream. This did include a exfoliating cleanser packet that I could use a few times so that hopefully made up for my other not so great products considering I can't use a exfoliate cleanser everyday. Product Description: update your nighttime routine with this lush cream- coco spurs circulation, while rice bran keeps skin supple and healthy. I apologize if this was a long, and ranting post this months box was a little disappointing hopefully the next few can make up for this months funk. 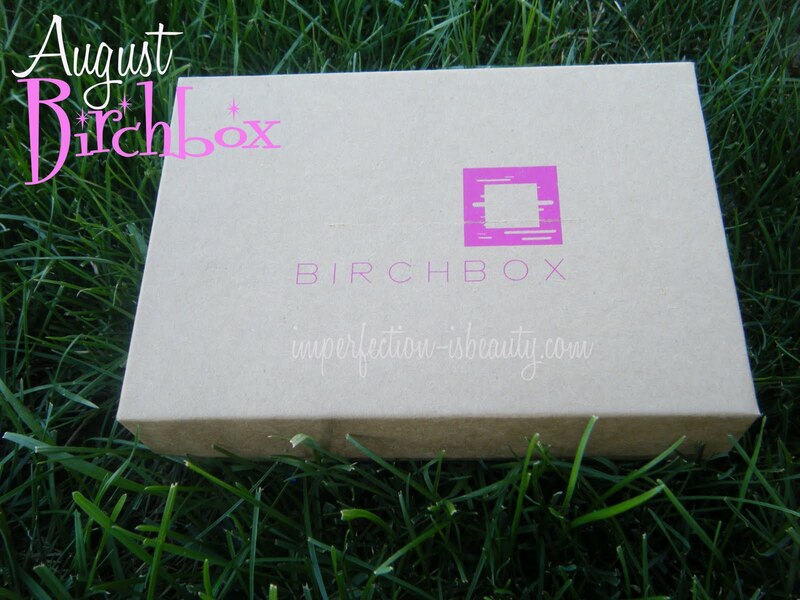 Do you have BirchBox? What products did you receive? 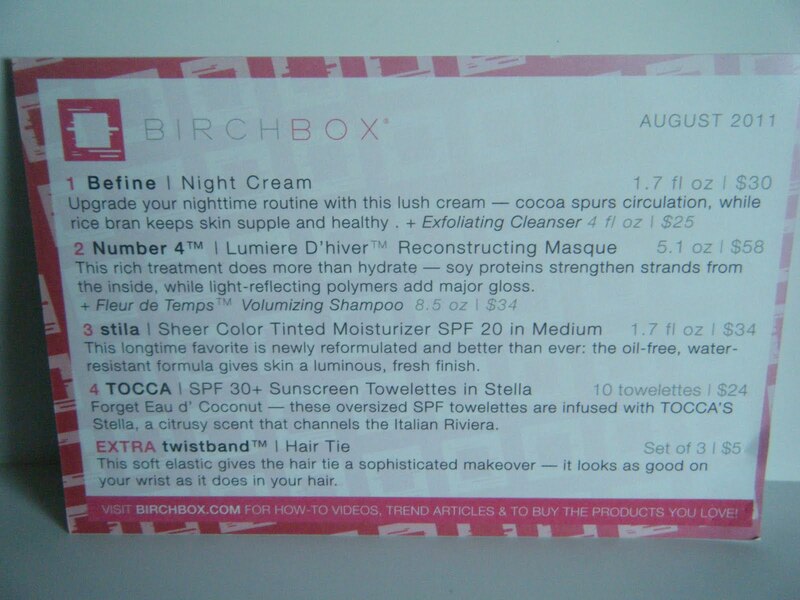 i really want to start getting birchbox!! its like a present every month! I would've loved to get the Stila tinted moisturizer. If I'd gotten that, the blinc eyeliner, and other things, I might not've cancelled my BB subscription! I am traveling, so I haven't gotten my box yet, but I know what's in it... sick of not getting makeup though!